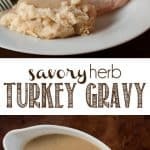 Savory Herb Turkey Gravy is the absolute best homemade turkey gravy from turkey drippings that you can serve with your Thanksgiving dinner. Savory Herb Turkey Gravy is an absolute must for your Thanksgiving dinner table, especially if you’re going through all of the time and effort it takes to roast an entire turkey. 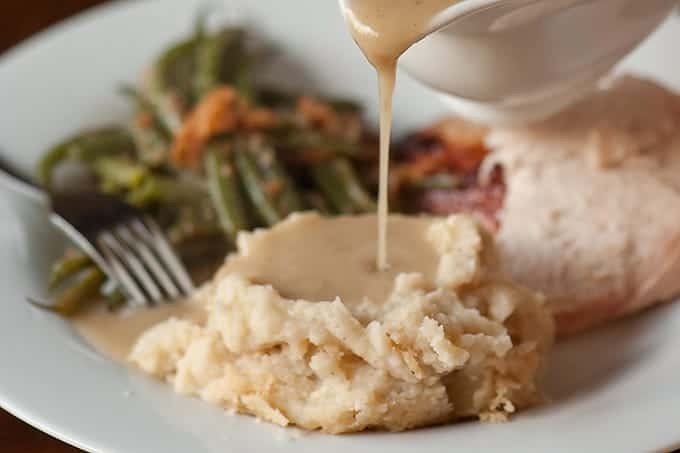 There are a lot of turkey gravy recipes out there, but I promise you this is the best method. Truth be told, turkey giblet gravy grossed me out when I was a kid. I used to watch my grandma cook the turkey neck and giblets and it nearly made me lose my appetite. As an adult, I would pull the giblets out of the turkey and throw them straight into the garbage. But once I realized the amount of incredible flavor the giblets and turkey drippings add to the homemade turkey gravy – I was hooked. Our Thanksgiving dinner always consists of this turkey giblet gravy along with some damn good roast turkey, roasted garlic mashed potatoes, wild mushroom stuffing, sweet potato casserole, green bean casserole, homemade fresh cranberry sauce, and easy to make rosemary dinner rolls. And, of course, we wash it down with some delicious Autumn punch. YUM! What do I do with the neck and giblets? When you buy a whole turkey, most often you will find a package inside the cavity of the bird that contains the neck and some of the vital organs. These organs can include the gizzard which is a muscle that grinds up food before it enters the digestive system (sort of a pre-stomach), the heart, the liver, and the kidneys. Your first instinct might be to pull them out of the turkey and throw them in the trash. Please don’t! I’ll go into more detail below, but what you want to do is sear these turkey parts to build flavor. When the neck and giblets hit a scorching hot pan, the surface instantly begins to caramelize, and this creates a deep, savory flavor once they simmer in the broth and drippings. I prefer to use a large stockpot or heavy bottom dutch oven. You’ll want to heat some olive oil over medium high heat, and once it’s pretty screaming hot, you’ll add your turkey neck and giblets. You can choose to omit the turkey liver as some would argue it adds a more bitter flavor, but I’ve always used it in my homemade turkey gravy. Once you give the giblets and neck a nice browned outside, you’ll add some onion, carrot, celery, and garlic – basically all of the good components to an amazing stock. Allow these to brown too so they can absorb all that flavor from the giblets. Deglaze with white wine. No explanation needed here other than you’d be crazy not to. Now, you’re finally ready to cover with water, throw in your peppercorns, bay leaves, and tons of fresh herbs, and make the most amazing turkey stock you’ll ever enjoy. I recommend allowing this to simmer for at least an hour, but we all know that they longer, the better. 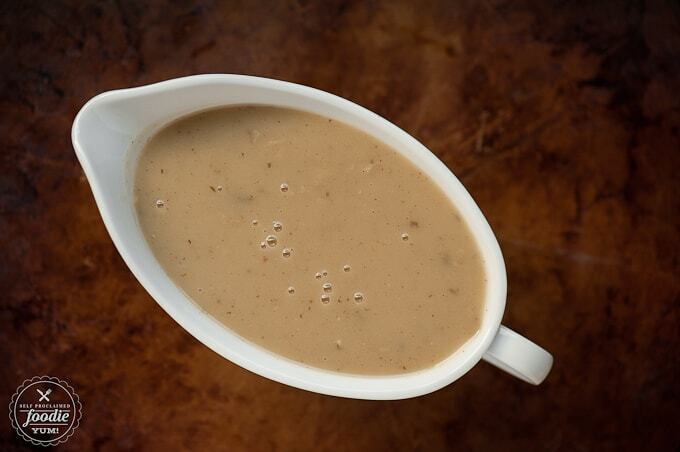 The secret to an outstanding tasting turkey gravy is the broth. Once the stock is done, you’ll strain the liquid away from the solids. I wait to do this until the turkey is just about done for two reasons: 1) I want my stock to cook for the longest amount of time and 2) when you make your homemade turkey gravy, you’ll be combining the stock with the turkey drippings from the roasting pan. Now you have a decision to make. Do you discard the cooked giblet solids? Or do you discard them? My grandma used to cut them up and add them back to the gravy after she nibbled on a few. I discard them, much like I do the bones and skin when I make my salmon patties. What you do is up to you and your personal preference! Next up is the roux. Its simple. the secret to a good roux is to have equal parts fat and flour and to let it cook until the mixture smells heavenly – like a cooked pie crust. Ladle in the stock mixed with the turkey drippings, whisking to combine with each addition. 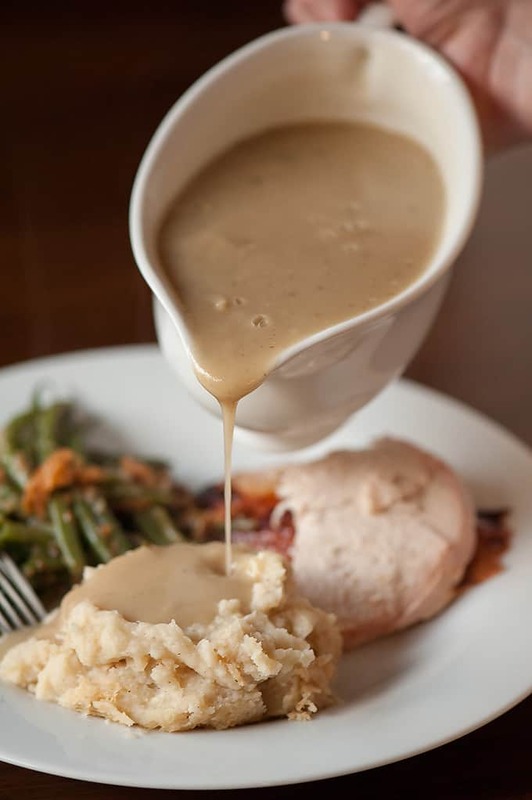 I can tell you this – this savory herb turkey gravy recipe is the best gravy you’ll ever make! I’ve been making gravy of all kinds ever since I was a kid. I have a photo of me where I was maybe 10 or 11 years old, wearing a heavy bathrobe because it was cold in our little Big Bear Cabin, slaving over a hot stove to cook Thanksgiving dinner. I’ve always loved doing that. When I first started learning how to make gravy, it was quite lumpy because I didn’t understand the roux. I just didn’t get it. But over the years I worked at it and practiced and now I can make an excellent turkey giblet gravy in my sleep. NEVER have I made it from a packet, I am proud to say. 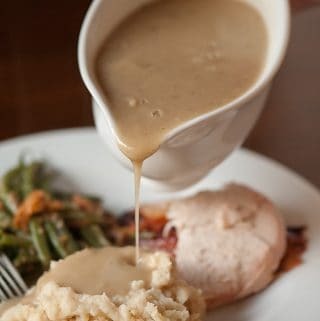 No Thanksgiving is complete without this undeniably delicious Savory Herb Gravy which is simple to make from turkey giblet stock. Heat oil in large stockpot or dutch oven over medium high heat. Add turkey neck and giblets. Allow to cook a few minutes undisturbed to get nice and brown. Use tongs to flip and brown other side. Add onion quarters, carrot, celery, and garlic. Allow to brown, stirring only occasionally, to brown all sides evenly. Add wine to pot and scrape bottom of pan to deglaze. Allow wine to boil and cook for a couple of minutes. Add water, peppercorns, herbs, and bay leaf to pot. Do not cover. Bring to a boil, then reduce heat to a simmer for at least one hour. Strain liquid into a container. Discard all solids except any meat from the neck you'd like to pick off. You can chop up the other giblets real small if you like that stuff too (I'm not quite at that point in my life yet). Refrigerate liquid so that the fat congeals on top (there wasn't any congealed fat when I did it). Once cold, remove solid fat from liquid. Combine remaining drippings from the turkey with the broth you cooked earlier. In a medium sauce pan, melt butter over medium heat. Add flour and stir. Cook until mixture is golden brown and smells wonderful. Add a ladle of your broth mixture and whisk until you have a thick paste and there are no lumps. Add another ladle and whisk again until smooth. Continue adding liquid and whisking until everything is combined and smooth. Reduce heat to low and continue to cook if gravy needs thickening. Add salt and pepper, as desired. Amount of salt depends on how much of the turkey drippings you use, so be sure to taste. Transfer to gravy boat and serve hot. This sounds wonderful! I have a couple of questions for you, please. I have a bag of giblets taken from a turkey cooked last week, and I froze them. Will frozen (then thawed) giblets be okay? And is there any benefit with using 2 bunches of giblets (the frozen and the fresh, minus all livers)? Also, can I make this broth a day in advance, then finish the gravy after the turkey is cooked? Ok, one last question… whew! If I don’t have much for turkey drippings, is there something I should use instead? Thanks so much for any advice you can give me. I’m new at this, can you tell? Hi Carolyn, The more giblets, the more flavor! You can certainly use both. I would just thaw the frozen ones first. Take them out of the freezer today and stick them in the fridge. You can certainly make the broth ahead of time and then make the gravy on Thanksgiving day. In fact, I might just do the same! The turkey drippings are mostly for flavor and can be omitted completely – no replacement needed!